Editor’s note: This story has been corrected to show Community Cycles was paying $50,000 a year in rent at its former location. 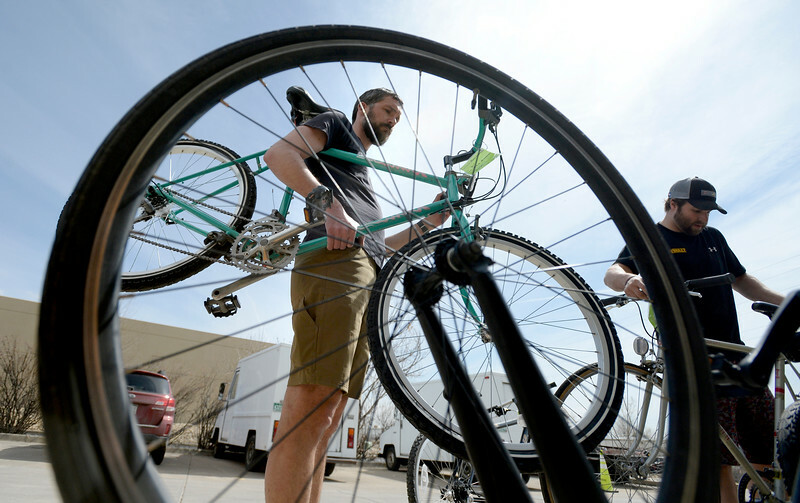 Boulder’s Community Cycles is in the midst of relocating to a new, bigger location on Spruce Street, and staffers and volunteers moved some equipment there in the most fitting way on Wednesday: by bike. Alexey Davies mounted a stack of more than a dozen wheels on the back of his bike, secured with bungee cords, and filled his saddlebags with odds and ends. The move means “we’re stable and here to stay,” said Davies, who has worked at Community Cycles since 2011. Then, he joined a caravan of cyclists from the old location in an east Boulder warehouse to the new location at 2601 Spruce St. They chimed their bells and played music as they carted equipment along Goose Creek Path and down Mapleton Avenue toward the new location, which is 700 square feet larger and provides more stability for the growing nonprofit in an increasingly expensive market. “This was our way to stay in Boulder and not get priced out,” executive director Sue Prant said. Community Cycles has been fundraising for three years, she said, and is now just $100,000 short of its $2.1 million goal. The funds are a combination of private and foundation donations, money from the city’s Community, Culture and Safety Tax, and a Boulder County Worthy Cause grant. Community Cycles bought the building in October and has been working on the fit-out since then, Prant said, and the new location will open Friday. Rent in the old location was $50,000 a year — money it can now spend on more community programs and services, she said. The new location also will allow for more offerings, including more indoor classes. Although most of the move was done by truck and van, Prant said, Wednesday’s bike parade allowed people to enjoy the sunny day in a way that was reminiscent of the nonprofit’s first move. Eric Smith, who has been volunteering for Community Cycles for several years, filled a bike trailer with tubes and nestled a box inside the tubes before leaving for the new location. Amorina Lee-Martinez, a University of Colorado doctoral student and Community Cycles member, took multiple trips between the locations, too. She’s been a member since 2015, when her bike was stolen. She volunteered and took classes through the nonprofit’s earn-a-bike program to replace her stolen bike, and she also found a community, she said. She helped paint the new space, in addition to the move, and she’s hoping to empower others the same way she was. “For me, being part of the community is helping others to see how important bikes are,” she said.